There were once many solid flat tappet street/strip cams for the 351C with intake duration at 0.050 in the range of 238° to 248°; literally everybody sold one. The popular Crane F246 is one such cam. This is my stab at the genre. I recently penned this camshaft for a Mustang owner. I thought I'd share it here in case anyone might be interested (if so I can provide full information). Similar cams typically have narrower lobe centers (108° to 112°), more overlap (70° to 85°), and a steeper torque curve ... the stuff drag racers like. The cam I've penned is designed to give the engine a wider flatter torque curve, thus the power is easier to control, and the torque curve is stronger at low rpm for accelerating out of corners. Its a “circuit racing cam tamed for the street”; estimated to produce 435 horsepower peaking at 6400 rpm. It provides a level of performance in terms of horsepower and rpm that is about all the performance the thin wall production block can handle reliably. Unlike all of the other cams within this genre, this cam will also allow the engine to retain good street manners. I think this would make a really nice cam for a sports car engine. What do you think? No comments eh? No interest in solid flat tappet cams? Was the last one too hot for you guys? 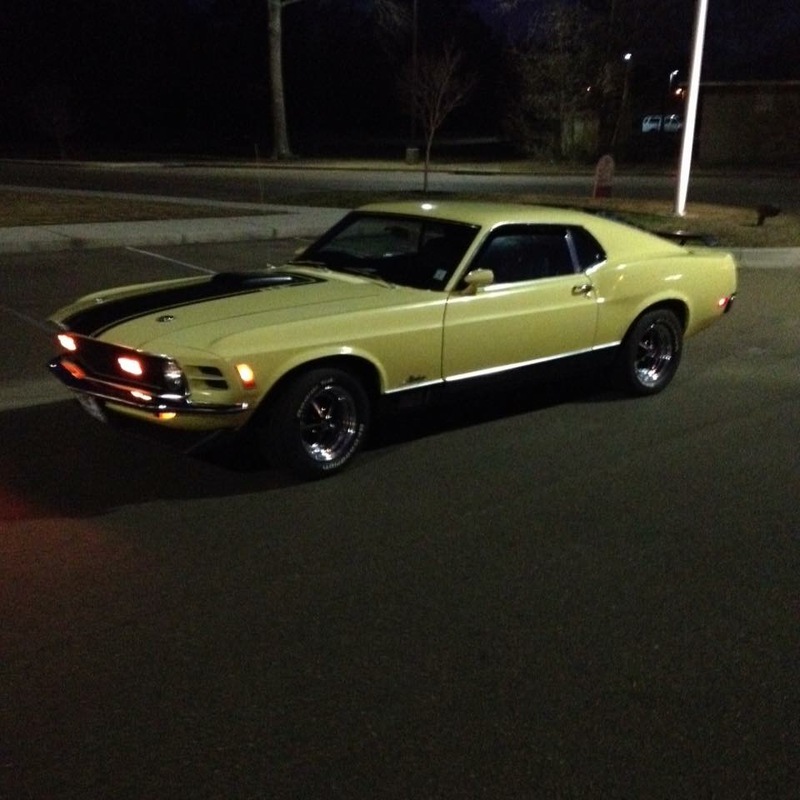 I once penned a Boss 351 replica cam … a milder camshaft than the last one. The lobes have 48° major intensity, which is very sedate by today's standards, this should provide for good longevity. 230° duration at 0.050 with a solid tappet cam is comparable to 222° duration at 0.050 with a hydraulic tappet cam. This cam would provide an engine with a very street-able power band, one that an old fart like me would enjoy; 405 bhp is enough for me. I am interested since I need a solid flat tapped cam in the near future. But I'm too big a noob in the Ford V8 world that I do not know what is needed. Have to learn a lot first. 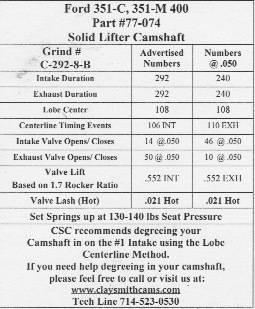 Here is the card for the solid lifter cam that came with my 1972 Pantera project. The engine was built about 20 years ago and had never been started. I worked with Clay Smith Engineering to get the motor ready to run and it ran quite well on a test stand. I've kept an eye on your car's progress, I'm thankful for your posts. No specific questions? I am hoping to get both good performance and good drivability from this cam. To say it another way, it would be nice if power came on at lower RPM's. It could happen because it has a 9:1 compression ratio by design (actually the second design). I am also hoping that there is adequate manifold vacuum to run the brake booster. On the test stand the engine was pulling about 12.8 inches HG. I think it is right on the fence for making the brake booster functional. But all of this is speculation until the car is painted, assembled, and driving. I am currently side tracked from this because I brought home another Pantera from Lancaster, CA in February. The car had been stored for decades and I am trying to get it on its feet. I am looking forward to getting back to this project shortly. Based on valve lift this is a 415 bhp cam, peaking at about 6200 rpm (4V cylinder heads). In order for the engine to have good over-rev, the exhaust will need to be low back-pressure. The low back-pressure exhaust would help the low rpm performance too. In terms of drivability the things that work against you are the 76° of overlap and the intake valve opening too early (IVO = 40° BTDC). I'm surprised you had 12.8 inches at idle. Some guys would like the rough idle. Its a cam designed to appeal to drag racers (and parking lot cruisers), with a rough idle, steep torque curve, and narrow power band. There's no way to adjust the timing and "fix" this cam. It is what it is. The 4V Cleveland heads are tuned to make peak horsepower at 6500 rpm. The way you "retain" low rpm power with 4V heads is to keep the overlap and intake duration conservative, keep the DCR around 7.6:1 to 8.0:1, use a carburetor with annular boosters and a dual plane intake manifold with a full height plenum divider. You don't need a big cam to make power with the 351C-4V. In fact Ford intentionally designed the 4V heads so that the induction system defined the power band and made the horsepower ... thus allowing good performance even though a "street friendly" cam is installed. The 351C 4V makes more horsepower and has more high rpm performance with 50° of overlap than most engines have with 76° of overlap. This is the drum I beat continuously. Yes, it is a drag race cam, and the motor was built that way originally. But Clay Smith Engineering explained to me that the cam is a relatively mild one and that some people use it for road racing. It did not have a crazy idle on the test stand. Since I already own it and it survived the initial startup and break in, I plan to give it a try. Perhaps it will be exactly what I want. Or it might be unusable and I will try a different solid lifter cam. A good friend of mine is an expert at swapping cams in a Pantera without pulling the motor. You are going to need a vacuum pump with that cam. You don't have enough vacuum for the Pantera booster. You need above 14 and it works best at 17. You are probably correct. One person at the shop said it will work with the booster and another said it will not (I think his words were "not even close"). Then the first guy said I might want to get a vacuum reserve canister. Since it is thier cam, they said they can grind down the cam down if there is an issue. Those would be the guys you see walking through the pits after the race with the brown spot in the seat of their pants. I wouldn't worry too much about changing it out. It's nothing spectacular. Definitely old technology. You can do a lot better now. What you pick though depends on what you want the nature of the car to be. To reach their full potential Clevelands need more cam than this. If you just want a cruiser with an idle like a 53 Merc with a 429 in it, go another route. Because of the short exhaust system even a mild cam in a Pantera tends to sound radical. There is lots of debate on what to pick and if you ask 20 people you will get 20 different opinions. None of them are wrong. Just different perspectives. I'm focused on the word "pick". The word leads a person into the mindset that the only choices are those available off the shelf. I pen my own camshafts, and have since the 1980s, because what's on the shelf doesn't provide what I want. Custom cams allow me to tailor the engine to have the characteristics I want it to have. That term ... "more cam" ... may draw the wrong picture in people's minds. A picture of high overlap, long duration, rough idling, and poor drivability. If that's what "more cam" means then I disagree with that perception. If we can agree that the production block is more or less good for 450 bhp and 7200 rpm, within that limitation the Cleveland can be quite drivable with the opposite of "more cam" thanks to the performance attainable with modern cam lobes which provide more valve lift with less duration. I know of a Cleveland producing 440 bhp at 6500 rpm using a 750 cfm Summit carburetor, Blue Thunder intake manifold, GTS exhaust system, 10:1 compression, and the "little" Crane HR-216 hydraulic roller cam. 440 bhp was attained in this case with "less cam". I also know of a Cleveland producing 500 bhp at 6500 rpm using IR fuel injection, a bundle of snakes exhaust, 10:1 compression, and the same "little" Crane HR-216 hydraulic roller cam. 500 bhp with only 50° overlap! The additional 60 horsepower of this second engine, using the same camshaft, was the result of higher volumetric efficiency and a better exhaust system. You gotta admit, the HR-216 cam is an unexpectedly small cam for a 500 bhp engine, and 6500 rpm is the lowest peak rpm you'll ever see 500 bhp made with iron heads, stock stroke, naturally aspirated, etc. For perspective the Pantera teams raced in Europe during the 1970s with 440 bhp utilizing the production block, the iron crank, and a 7200 rpm rev-limit. Ford teams competed in NASCAR during the 1970s with 570 bhp engines utilizing the heavy duty Bud Moore & Tope blocks, fully counter-weighted steel cranks, and an 8500 rpm rev-limit. Pick = select = make a choice. The builder needs to make a choice. Custom grinds have always been available. In an ideal world we would be able to hear, and drive the car with various cam profiles to help the decision. Many don't really know what they want or what 300, 400, 500, 600 hp means. It would be interesting to me to experience all of the variable choices. I doubt that there is just one magical one that fits all, but maybe there is? Probably a hydraulic roller design is the most efficient and the most practical currently. It really depends on the use of the vehicle, type of vehicle and what the owner wants out of it. I'm not a cam designer. I leave that up to others. I can only share my 45 years of experiences with others. Cams aren't just that black and white. That is not my experience, I have found they can be reasonably predictable. Hey George, love your posts and insight. my 408 stroker had a 297,304 dur. 262,268 @.050. 661,637 lift solid roller on 112 LSA. intake closed at 59abdc running on e85. alum. heads 330 CFM @ 500 lift. ran too! good with poor street manners. changed intake from 8 stack EFI to a dual plenum opposed throttle bodies 65mm x2 and created a stumble off idle. so I have sent cam out to regrind and remove 10deg from int. and ex dur. and up the LSA to 114. all else to remain the same. it is a bumpy idle but not a daily driver so I don't care. I also dropped compression to 11:1 prior to cam swap. reason is I cant get E85 everywhere I go and that limits me. Never pinged or detonated confirmed when disassembled. Had 11Hg on a good day. hope to see a bit more with regrind. Manual Wilwood brakes so no worries there. Still it runs with the best of them. just a little louder. cams are not that difficult to swap in the Pantera just have a seat n relax, sort-of in the fetal position. Rich posted two cam specs. Today I would change this cam by using a 290° exhaust lobe (the best matching lobe I found is #F292/354. 292° advertised duration, 255° duration at 0.050, 0.586 net lift at 0.026 lash). Curious why? Because we never really need more than 290° exhaust duration. And by shortening the exhaust duration I can "tighten" the LSA without increasing overlap. I'd move the exhaust centerline to 115° BTDC, and move the intake centerline to 113° ATDC. That narrows the LSA to 114°, 99% of my cam are 114° LSA these days. Today I'd move the intake centerline to 111° ATDC, making the LSA 113°. I just don't get so fussy as to specify 1/2° LSA or lobe centers any more. Chalk that up to old age. But on the positive side overlap decreases by 1°. The first cam has lobes with longer ramps and would make the better street cam. The second cam is definitely more of a race cam (short ramps and more lift). Its definitely going to push the cylinder walls of the production block to their limits under racing use. On the positive side the 70° IVC means you won't have to run a bunch of static compression, the engine will get by with 10:1 and 91 octane fuel. Both cams will give an engine Boss 351 type low rpm performance, yet peak horsepower is going to occur ~ 7000 rpm. Tanti Cavalli! That's the beauty of modern cam lobes, at least from my perspective. What are your thoughts on my cam IVC @ 59deg. As stated I have not had any pre ignition issues. Premium fuel of course, and this does give the already high static compression its full capability. I am fairly certain the 59° IVC you are quoting is based on duration at 0.050. The only reason cam grinders give valve event info based on duration at 0.050 is to assist the installer in timing the camshaft, because valve events at 0.050 have otherwise no bearing on an engine's performance. An engine's dynamic compression must be calculated based on the "SEATED" intake valve closing. We rely on a cams "advertised" duration for computing "seated" valve events. The advertised duration of most solid tappet cams is based on 0.020 inch tappet lift; 0.020 inch "lash" at the tappet is equivalent to 0.035 inch lash at the valve (1.73 rocker arm ratio). So unless cams rated at 0.020 have 0.035 lash, their advertised duration will not be accurate, and the valve events computed with that data must be take with a grain of salt. The limits of the production block under racing conditions is 450 bhp, 7200 rpm, and 8:1 dynamic compression. Race conditions means the engine is operated WFO down long straight-a-ways lap after lap. Sure owners get away with engines making more power, but not under racing conditions. A street engine is operated 99% of the time at part throttle, and an engine operated at part throttle is not producing anywhere close to its maximum compression. Drag racers get away with more power, but the experienced ones know that to go racing with an engine employing the production block making anything close to 500 bhp will require grout in the water jackets. Grout is a viable solution for drag racing, but not for circuit racing. Grout is not ideal for street cars either as it makes the oil run hotter. Now that Tim Meyer is producing heavy duty blocks the solution is easy, the folks wanting to build high output engines should utilize one of Tim Meyers "Track Boss" blocks as the foundation for their engines. ok so I think I understand a bit better now. Yes looking at my cam card, it is based on the .050. however I am having difficulty calculating the actual intake valve closing degree ABDC. kindly take a look at my old cam card. Note the regrind will be Duration 252 Int. 258 Ex. at .050 LSA 114. also in the notes I do not know what VN159 Int. VN122 Exh. stands for. Thanks again for your insite. Thanks Rene, You make sound so easy..